I’m not a regular user of Snapchat, but I do like the concept of ephemeral messaging. It’s nice being able to share content with a friend and not have to worry about it being saved for eternity. It gives you more control to decide who sees what, and for how long. That’s why I was drawn to the concept behind Digify, a newly launched smartphone app for iOS and Android. Instead of just sending a basic message, Digify lets you give others access to files like Word and Powerpoint documents for a finite period of time. The recipient won’t be able to forward, download or otherwise copy your document – they can only view it on the terms you’ve set in the app. The app itself is fairly simple to use – you simply need to create a free Digify account, confirm it by email and sign in to it. Sharing a file works similar to composing an email, but you’ll be asked to choose a self-destruct time ranging between 1 minute and 1 month. 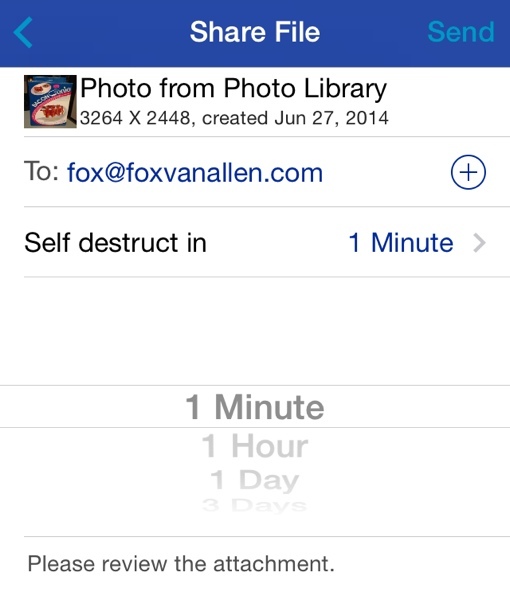 You can either send files (or photos) stored on your phone or send a Dropbox file directly from the Digify app. A separate statistics panel in the app will let you know who opened each file and for how long. If you accidentally send a file to the wrong person or want to otherwise revoke access for any reason, Digify makes it easy to make everything right. Just click the little power button icon next a recipient’s address in the statistics panel to immediately unshare. There are a few downsides to the app, of course. The recipient will need to install the Digify app to view your file, which can be a bit of an inconvenience. And while there’s a desktop app for PCs, Mac users are out of luck. The security isn’t foolproof either, so use caution before sending a truly sensitive document – someone could use another camera to take a picture of their phone as they view your file. Drawbacks aside, Digify seems to fill a real niche for everyday and business users alike. If you’re interested in giving it a try, you can find the free Digify app on the Apple App Store (for iOS) and on Google Play (for Android).